The reds won because they were centralized, liked by people etc..
-the lower classes were generally Red. Middle and upper classes were white. 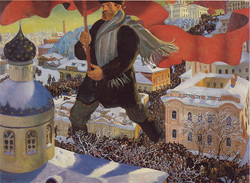 Boris Kustodiev's 1920 painting "Bolshevik". If there was no segregation at that time, would there have been two different groups (reds and whites)? Summary: The Russian Civil war consisted of 2 groups; the 'Reds' (Bolsheviks) and the 'Whites' )all opposing groups). The Reds ended up winning the civil war because they were centralized and liked by people.